The Rowan University D-II ice hockey team returned to the rink to begin the 2017-18 season on Saturday night. The Profs took advantage of a shortened Wagner College roster to power their way to a 6-3 victory. Wagner struck early in the first as Michael Migliorisi sniped the puck past Rowan goaltender Justin Natiello. After that, Wagner never came close to having a lead again, as the brown and gold rattled off four unanswered goals, all by different players. Connor MacEwen led the Profs in scoring to start the season with a goal in the first and the empty netter at the end to seal the win for Rowan. After allowing the first goal, Natiello, who is entering his senior season, shook off the rust and displayed the midseason form the fans were used to seeing him in last year. Once the proverbial “rust” was gone, the young Profs began to take to the body of the Seahawks, not fearing to lay crushing checks along the boards and in open ice, setting the tone for the rest of the night. Rowan showed the youth and lack of experience early, but as the game wore on, they began to cut off Wagner’s opportunities in the slot and showcased impressive passing lanes in neutral ice. Rowan entered this season with a young core of talent, as the veteran group that took the team to the playoffs last year are no longer around. 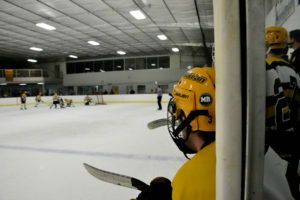 For this young squad, all eyes will be on Natiello, who played 10 games last season in a rotation with Cody Reilly, and will be looked upon as the leader for the next crop of Rowan hockey players. This is a role he looks to embrace. Despite the youth movement, Caulfield is confident that his squad can return to skating on postseason ice come the springtime. The Profs remain home to face Virginia Tech at the Hollydell Ice Arena next Friday at 8:15 p.m.